Cubomania is the world’s first blockchain-powered online educational platform which will revolutionize global K-12 education. No one will dare to deny the fact that childhood is easily the most important period in every person’s life as the experiences people have in childhood shape the brain and their capability to learn, get along with others, and respond to daily stresses and challenges. However, the process of child upbringing and development is not without its challenges for both parents, educators, teachers and any other people working in the field of education. First of all, today’s children are far more developed than their peers even 10 or 15 years ago. Today 5-year-olds can use mobile phones, tablets, e-readers. They can surf the net. They know what a touchscreen is. This is happening as each subsequent generation capitalizes on the knowledge and experience obtained by the previous ones. As our living standards -– involving nutrition, education, safety, and many other factors – have significantly improved over the past 100 years, our ability to solve cognitive problems likewise increased. Therefore, in order to develop, children need a much higher intellectual load than in the past. They need the latest educational experience-based programs that will let them acquire skills and knowledge that are in demand today. However, schools and kindergartens don’t always manage to respond to the fast pace of technological development. Another problem is that all centralised educational systems are like educational factories where all children study the same subjects at the same time regardless of any individual characteristics. However, will this approach work in the information age? Finally, nowadays parents are so busy working that they barely have time to fully control what their children learn, what skills they obtain and what personality traits they develop. Despite this, parents really want to manage this process, and they desperately need a tool through which they will influence the process. Creators of educational content face a lot of difficulties as well. For example, modern payment systems don’t allow to make transactions so smoothly as the Blockchain technology does. Another problem they are faced with is that copyright registration is so complicated a process that content creators hardly ever register their intellectual property. Further, their content is distributed for free. And, in most cases, they are not even aware of that. Finally, most content creators don’t have technical base and tools to create educational programs of any level of complexity themselves. They need to involve some specialists who possess special skills and knowledge in the IT sphere which is quite difficult. As a consequence, content creators either create great educational content, but don’t gain financially for what they have created or become demotivated to create anything worthy as they are aware of the potential problems. Cubomania is an online platform of early childhood education with the integration into the physical environment. The synthesis of these two interesting and absolutely unexplored markets in terms of using the blockchain technology creates a unique opportunity for the first investors in this segment. So far, there haven’t been any similar platforms as almost all attention has been paid to university education and student preparation for a better integration into the working community. Companies which create technologies and professionals who develop the content used in digital economy should consider the possibility of taking part in our platform development if only to represent the technology they create in the course materials available for millions of prospective students. Lack of competition in this segment holds much promise for Cubomania. According to more optimistic forecast, it is projected to reach a record 252 billion US dollars by the year 2020, with a growth rate of approximately 17% annually. 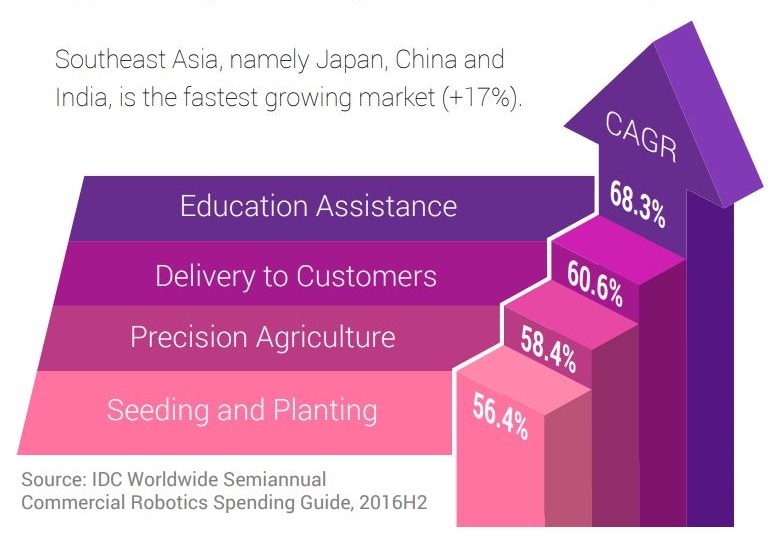 /EdTechXGlobal , IBIS Capital/ Southeast Asia, namely Japan, China and India, is the fastest growing market (+17%). 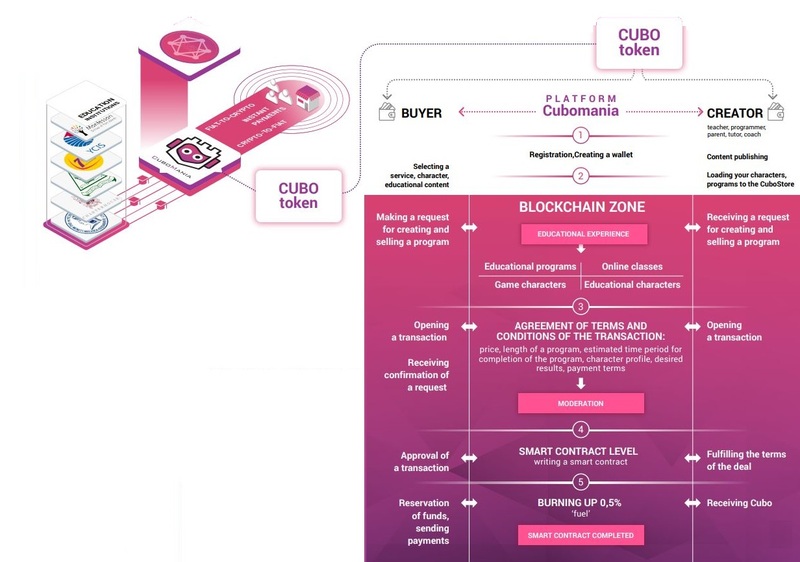 The Cubomania educational platform and a user reward mechanism are the core of the ecosystem. The wallet functions as an entry to the ecosystem and allows users to be rewarded in CUBO tokens for their educational achievements and content creation. CUBO tokens can be used as a means of payment to purchase goods and services in a marketplace starting from 200+ existing educational characters and programs and, later on, a broader database of educational content. 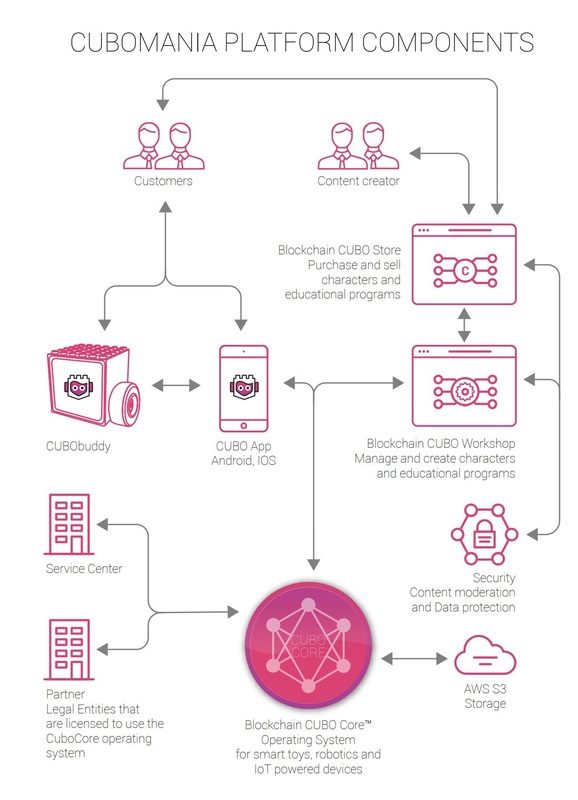 The Cubomania eco-system includes the following elements: CuboBuddy (a hardware product), CuboApp (a mobile application), blockchain educational platform (online Workshop + Cubo Store) and CuboCore (Robot Operating System). CuboBuddy, a robotic educational toy, is the first element of the Cubomania blockchain eco-system. The main purpose of the toy is to provide complex interaction between a user and an AI-based character with integrated educational programs. CuboApp is a mobile application that connects the source of educational content on the blockchain and the CuboBuddy educational toy. CuboApp can also be used for accessing educational content independent of the toy, which can be regarded as an extension of the CuboApp. Blockchain Cubo Store and Cubo Workshop are the key elements of the eco-system. Blockchain mechanics combined with the platform interface is expected to ease the process of content creation and distribution as well as grant teachers and pedagogues maximum protection of their intellectual property. CuboCore™ Robot Operating System is a robot operating system with builit-in educational programs that can be installed on any kind of IoT based devices: drones, toys, robot constructors. CuboCore provides full integration with the Cubomania educational platform. Cubomania Device's development; taken part in 11 technological events; Vernadsky Challenge winner. Finished product CuboBuddy; Cubomania CES 2018 TOP 12 finalist from more than 900 startups; Token Sale Launch. Educational platform beta release; CuboCore ROS early stage development; Establishment of production line. Scheduled launch of the Cubomania educational platform; Development of distributions channels; Education AI based assistant BETA release. CubboBuddy sales start in Japan, China, Europe, USA, UAE. Education AI based assistant launch. Release SDK for robot developers.